In addition to performing as a violist in Pittsburgh, Tatyana Swanson, offers private instructions on violin and viola to children and adults of all ages and levels. 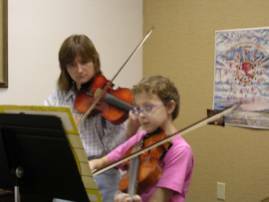 Private violin and viola lessons take place at the School of Music in the North Hills of Pittsburgh and at Mrs. Swanson’s private residence in Baldwin, PA. Each student will receive individualized attention and a teaching technique designed to fit his/her skills and ability. In addition to learning the skills of a given instrument, the lessons address basic music theory, as well as an overview of music history, improving overall musicianship. For children, private lessons are very important if they are planning to participate in various youth orchestras and ensembles throughout the area. Most of them will require an entrance audition from a student in order to become a member of an advanced orchestra. Mrs. Swanson has an extensive experience of planning a repertoire and audition music that will give a student a higher chance of getting into those ensembles. Please contact Mrs. Swanson for more information. Most lessons are 30 minutes long, once a week. A different schedule may be set up based on a student’s need and level. The lessons are constructed with an individual game plan for each student based on his/her level, potential and future goals. The fundamentals of music theory and history are covered with workbooks for younger students. Technical goals are outlined and monitored with weekly assignments and a goal completion sheet for younger students. Extensive classical music repertoire is covered such as violin/viola concerti, in addition to scales, etudes, duets and other genres of music. Focus on proper application of practicing techniques, emphasis on “quality” vs”quantity” approach, establishing the idea of a student being his/her own teacher. Review of upcoming playing tests and orchestral auditions as needed. Recommendation letters are provided after five years of private lessons.